1. If I understand correctly, userpoints are given relative to the price of product(s) bought. How do I restrict the products where users can collect points. 2. Where can I see/ where can a customer check if there are any points earned? 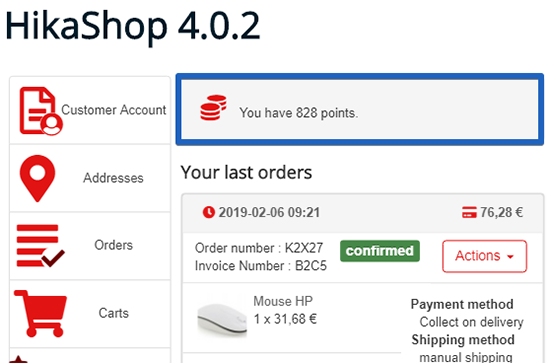 - First go to Extensions => Plugins and look for : "HikaShop User Points plugin"
- in SPECIFIC CONFIGURATION part you find "Product categories" to restrict point to a product category. Your customer can see his point in his "your account", you have a default hikashop item menu to publish for allow your customer to reach it. But before this, your question leads us to practise some test on the userpoint plugin, and when we realize that in some condition the display option won't work, so I invite you to update again your 4.0.2 in order to have fix specific for this option. Last edit: 2 months 6 days ago by Philip.